It must be a very old house. I love the huge thatch roof and the facade of half-timber. it's the right word. in German it's called Fachwerk. I see they built on over the years. A beautiful old house - I also love that enormous overhanging thatched roof and I believe it is what you term as half-timber A lovely find Bep ! It’s beautiful. I love the roof lines. I love it! I was looking at a small A-Frame house in Plymouth, MA. This little house is so quaint! Beautiful. I'm curious about how the roof space was used. Lasting well anyway! Beautiful find. I love the thatched roof. 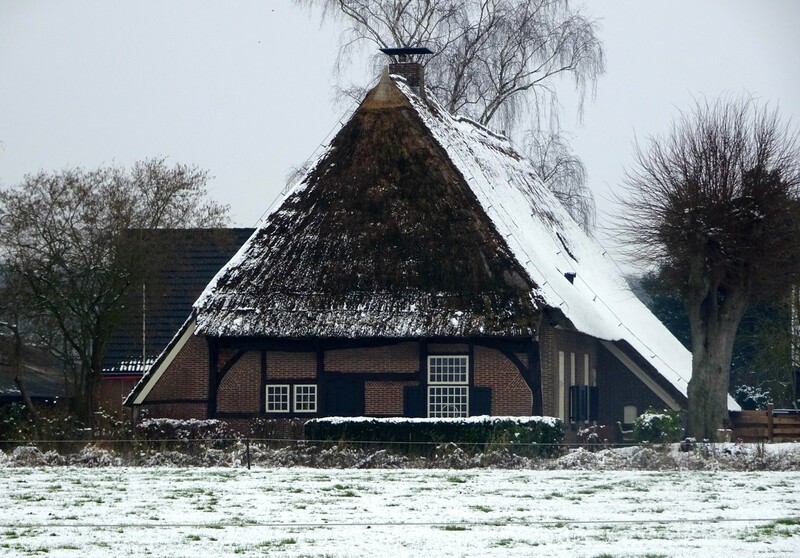 Beautiful farmhouse with that dusting of snow. Gorgeous Bep, I have never seen one like that....love it & a fave. Het lijkt me niet typisch Drents maar ik kan me vergissen en mooi is ie wel. Wij zouden het een ``Vakwerk`` huis/gevel noemen.